Enjoy the large grassy yard, while the young bicycle enthusiast rides on this dead-end dirt road or explore the rocky hillside this cabin backs up to! There is no one behind you except trees and adventure and maybe some deer! This cabin has a nice big living room and a good sized kitchen. It has a separate dining area and another area, a game room, for the kids to play in! This 3 bedroom cabin can sleep up to 6 people! It is also located next to the Pond Cabin and the Eagle Lodge Cabin, so a larger group could stay in the same area! This cabin has a washer and dryer in it which is awesome for those who like to adventure and need some clean clothes or swimming suits! This cabin has a great deck to sit on and enjoy the mountain view! 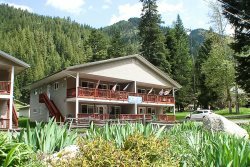 It is in a quiet, private location and yet it is still close to most of the Wallowa Lake activities including hiking trails, go carts, horseback riding, and more! Come to this neat little cabin with your family!